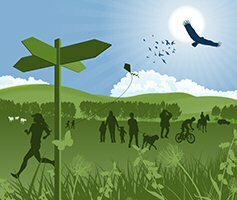 East Sussex have launched a new rights of way rights of way consultation. It is open for input until 20th February 2015. If you click on the above link it takes you to an introductory page “Shaping the future of our countryside access” and near the bottom of that page there is a link (also called “Shaping the future of our countryside access”) that takes you to the consultation form itself. Or you can just go straight to the consultation form itself. The truth about this kind of survey is that they don’t usually get a huge number of responses, which means that if you do respond, your views are likely to have a definite influence on the conclusions of the survey, particularly if you use the free-format comment boxes. If nothing else, filling in the survey sends a message to ESCC that we do care about our paths.